DC’s Uncle Sam is one of the stranger superheroes, taking the public-domain personification of the United States and turning him into an active crusader for the most idealistic American values. After being introduced by Quality Comics the 1940s, Uncle Sam and other Quality characters were integrated into the DC Universe in the 1970s as the Freedom Fighters, the superhero team of Earth-X, where Nazis won World War II and took over the planet. The current Freedom Fighters miniseries returns to this alternate Earth for the latest interpretation of the team, offering a chilling story about fascist oppression and the revolutionary force that rises up to fight it. 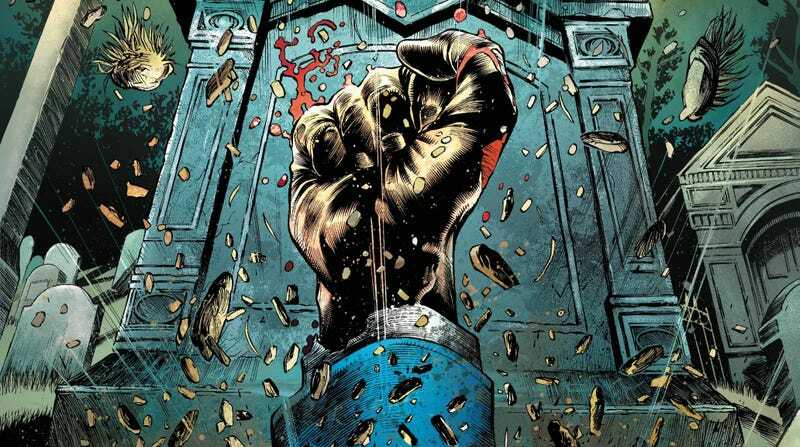 Writer Robert Venditti balances political commentary with compelling character dynamics and thrilling action spectacle, giving artist Eddy Barrows, inker Eber Ferreira, colorist Adriano Lucas, and letterer Andworld Design a lot to work with visually as they take readers across this new American landscape. Uncle Sam appeared to die when the U.S. fell to the Nazis in the first issue, but as the revolution grows, the spirit of America resurrects. This exclusive preview of this week’s Freedom Fighters #4 shows Uncle Sam clawing his way out of the ground in The Heartland, an “extradimensional realm of ideas,” rising up us as the Freedom Fighters plant explosives in the Nazi Mount Rushmore. These pages highlight how the creative team takes advantage of iconic American imagery, starting with the image of a bald eagle being shot down by Nazi soldiers. This is followed immediately by a double page spread of Mount Reichsmeir, which reinforces the might of the Nazi force with a massive throng of soldiers standing in formation. But despite this overwhelming power, the resilience of America still shines through. These first pages cleverly use red, white, and blue in these scenes of Nazis destroying American symbols, a color combination that foreshadows Uncle Sam’s return to help the Freedom Fighters save the country.